The most elaborate tree nests are the leaves nests of weaver ants. To achieve this construction, they must first bring the leaf closer. 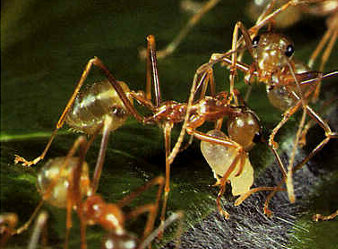 Weaver ant workers form chains with their own body. Together, they develop sufficient force to fold the leaf. 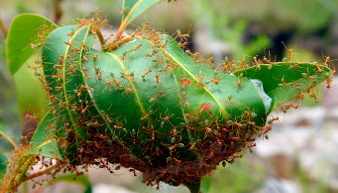 When a leaf is at its place, ants fix it with larva silk. 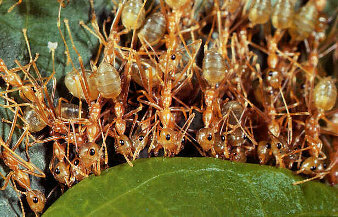 To make this connection, a worker comes with a larva ready to molt and move its head between the leaves. Ants stimulates larvae with its antennae making larvae produce a silk thread. Unfortunately, these nests did not last long, no more than one month, forcing weaver ants to build and move endless.